PARENTS This is a story based on John 21:1–14. The disciples, unable to hold back their smiles and laughter, couldn’t believe what was happening! Less than an hour ago they were cold, wet, hungry, and discouraged after an unsuccessful night of fishing. Now, with the sun coming up on a glorious new day, they were warming themselves by a crackling fire, savoring the aroma of a hot breakfast, and were looking again at the face of their beloved friend, Jesus. Not to mention, behind them was the fullest net of fish they had ever seen! “Just throw your net on the other side of the boat,” was all He had said, and then THIS! Their minds and emotions raced. It seemed like an amazing dream! Then, Jesus handed them some bread and fish. It really was Him! Even more than the fire and the breakfast, what really nourished their souls and warmed their hearts were the stories they shared as they recalled what Jesus had done in them, through them, and for them. Read the story of the miraculous catch of food, and Jesus serving the disciples breakfast, found in John 21:1–14. The story above is what I personally imagine happened as Jesus and His disciples all had breakfast together. What Jesus-stories do you think they might have told? If you could sit around the fire eating breakfast with Jesus, what would you talk about or ask Him? Who is someone you know who is a good story-teller of the things God has done in his/her life? Taking time to remember what God has done, and to tell those stories of His faithfulness, is a meaningful tradition that has been passed down for generations of God-followers. With your family, as you eat a meal or, ideally, as you sit around a fire, share and re-tell stories of how God has surprised you, blessed you, provided for you. Be intentional about remembering the amazing things God has done for you and your family. Remind each other of how He has loved you well. Then, over the next week, share at least one of those stories with someone who has never heard it, as a way to point people to our all-powerful, yet personal, Savior. 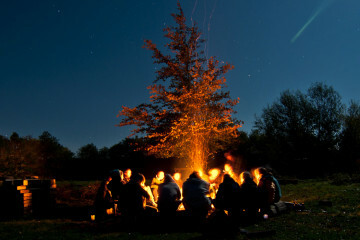 Next ArticleThe Danger of Stories Around a Campfire!